Skyward by Brandon Sanderson. Review. Spensa’s world has been under attack by the Krell for generations. She has only known war and has always dreamt of being a pilot her whole life. But she is unlikely to fulfil her dream as her father, who was also a pilot, was shot down in combat for turning on his own. The Defiant Defence Force (DDF) decides who flies and it is run by Admiral Irons, one of the pilots involved in shooting down her father’s ship. But Spensa can’t ignore her dream or the stars that call to her. If she can control her temper, her outbursts, her emotions, then maybe she can prove everyone wrong about her and her father. We are formed by our past and sometimes those events can be so extreme they affect us for the rest of our lives. The past weighs heavily in this book. Spensa is a product of her father’s legacy as a coward, her great-great grandmother’s legacy as a mutineer, her people’s legacy of fighters trying to repel the Krell and keep the remains of humanity safe. The only thing she isn’t a product of is her own free will. But in the end, that is the one thing Spensa must do. She has to throw off the past and decide for herself what her future looks like. This is a YA novel which is not my normal choice of book. There were elements I couldn’t get on with, Doomslug and the overly talkative and sassy MBot being two of them. 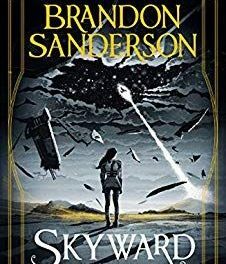 That said, Sanderson uses those elements sparingly, as part of the narrative rather than taking over, so my enjoyment remained high throughout. 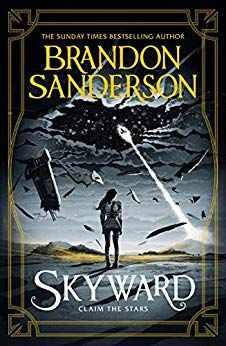 At times, I could even forget it fell under YA because Sanderson does not give the young people in his novel an easy ride. There are deaths and mistreatment. I found the cruelty towards Spensa because of something her father did years ago hard to read which made me root for her more. She’s a plucky character, realistic in her attitude and naivety, mouthing off to her superiors and being shot down because she doesn’t have all the information. That endeared me more towards her than anything else because we’ve all felt the acute embarrassment of saying something we shouldn’t. This is an explosive start to Sanderson’s new series. It’s fast-paced, non-stop action, full of twists and turns, and truths only half understood. I couldn’t put it down, falling victim to the lie we tell each ourselves late at night; just one more chapter.